Pick up from your hotel or Nile cruise in Luxor , then drive via air-conditioned modern vehicle to Dandara which is situated at the north of Luxor, it is far from Luxor 85 Km. In Dandara you shall visit the beautiful temple of the goddess of beauty Hathor , Well-preserved temple , has a massive stone roof, underground passages and a magnificent rare relief of Queen Cleopatra IV and her son caesarion. The Temple of Hathor, it was known as the 'Castle of the Sistrum' or 'Pr Hathor' - House of Hathor. 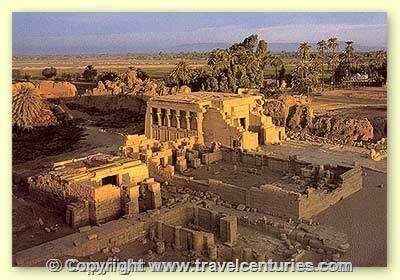 Then continue to Abydos city, it is far 135 km from Luxor. There you will visit Abydos temple where the ancient Egyptian believed of god (Lord of the underworld) to be buried there. The temple was built by King Seti I, and completed by King Ramsess II, known as temple of Seti I. The paintings of the gods and Pharaohs on the walls of the Osiris Temple at Abydos are among the most beautifully preserved in Egypt. Getting to these sites you will pass by local villages and majestic sceneries for the River Nile and the fields. They are as enjoyable as visiting the temples themselves. After finishing your tour drive back to Luxor directly to your hotel or Nile Cruise. Price per person : $ 120 US Dollars!! Minimum 02 Persons! !